This short article is in need of work. You can help Sega Retro by adding to it. Pachinko (パチンコ) is an SG-1000 game developed and published by Sega in 1983. It is, as the name suggests, a video game version of Pachinko, a popular game in Japan. The game did not see an international release. 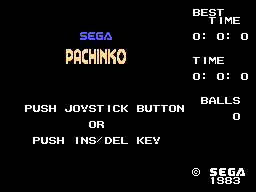 Pachinko is an extremely rare game for the SG-1000. Soon after release, it was recalled from sale due to a game-breaking bug (need to verify) and very few copies remain in the hands of collectors. This is probably the very first instance of a recall in Sega's history (?). As of 2013, a recent auction of the game on Yahoo Japan was won for ¥113,500, but it has been known to sell upwards from ¥200,000. The bug was fixed and the game was re-released a few weeks later as a "sequel", Pachinko II, which is much more common.